The AEM 26-3000C fits some Subaru WRX models. See vehicle applications for details. The AEM 26-3000C Intercooler Charge Pipe Kit is a free-flowing, mandrel-bent aluminum tube designed to replace the restrictive factory intercooler piping on specific turbo charged Subaru WRX models. 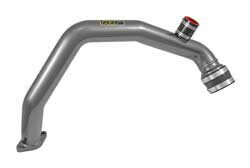 The AEM charge pipe has been engineered to reduce turbo charged air pressure loss as well as dramatically increase air flow from the turbo to the intercooler. The specialized aerodynamic tube design produces a noticeable horsepower and acceleration gain from your engine. The tube also features a fitting that can accommodate the factory or any other after-market diverter valve or blow-off valve. This allows you to choose the type of valve that will give you the specific boost performance, blow-off acoustics and under-the-hood style to fit your needs. 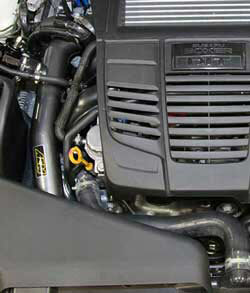 The AEM intercooler piping is constructed from lightweight aluminum with a durable gunmetal gray powder coated finish. For additional horsepower gains and improved engine compartment aesthetics, the AEM 21-732C Cold Air Intake System can be installed into your vehicle as well. The charge pipe kit is easy to install with commonly available tools and it is backed by AEM's Lifetime Limited Warranty. I am very pleased with the AEM Charge Pipe and Recirculation Kit. I recently installed both on my 2015 WRX and immediately noticed several positive changes. First, you get a noticeable gain in horsepower in the mid-range and second, your boost increases far more rapidly. A third benefit is the audibly noticeable increase in turbo-spool, which sounds amazing. I installed an after-market blow-off valve to replace the stock BOV. It works very well with the Charge Pipe. The installation of the pipe was plug-and-play no MIL or codes thrown. Prior to this purchase, I installed the AEM's Cold Air Intake and Strut Tower Support. In my view, AEM's products are engineered well, fit perfectly and come with simple DIY instructions. Good stuff...and by the way, if you keep your engine bay clean and sharp, AEM's products will serve to only compliment. Thanks folks.